Jarfull, a new restaurant, is changing the way meals are served; nachos, idlis or banana bread, everything comes to the table in cute jars! 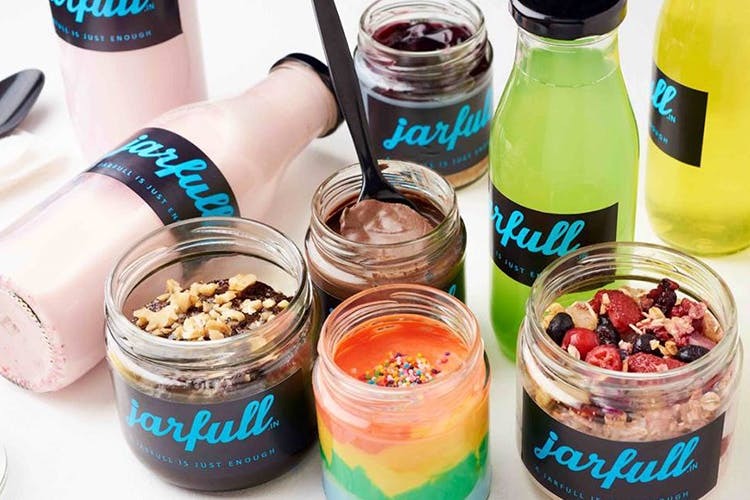 So, don’t expect full meals – Jarfull is the place to go for small bites, dessert and all-day breakfast. We love the idea of portioned meals so you can indulge your dessert cravings without going overboard. Located in Sushant Lok, Jarfull has a menu that isn’t a mouthful – expect beverages, snacks and dessert. No time for breakfast? Grab a jar of their Podi Idli for INR 79 and still get to work on time. If you prefer sweet over savoury, choose one of their four yoghurt parfaits for an added burst of energy to get you through the day. Our favourite thing about Jarfull is their selection of desserts – banana bread, cheese cake, rainbow mousse or sticky toffee pudding. Whether you need a pick-me-up after a bad day or have a sudden craving for red velvet cake at work, Jarfull is worth calling up. Give your plates a break and order from Jarfull. Plus, there’s virtually zero clean-up required!